The completed powerhouse, with Canyon technician Spencer New. The Hystad project developers selected Canyon Hydro to design and manufacture the twin Pelton turbines. Canyon provided Alconza generators as part of the water-to-wire system. The Hystad intake system under construction. To reduce the cost of transporting concrete to this remote location, the developers purchased their own trucks and mixed the concrete on site. The Hystad intake system near completion. The completed Hystad intake system, with project developers Chad and Duke Peterson. 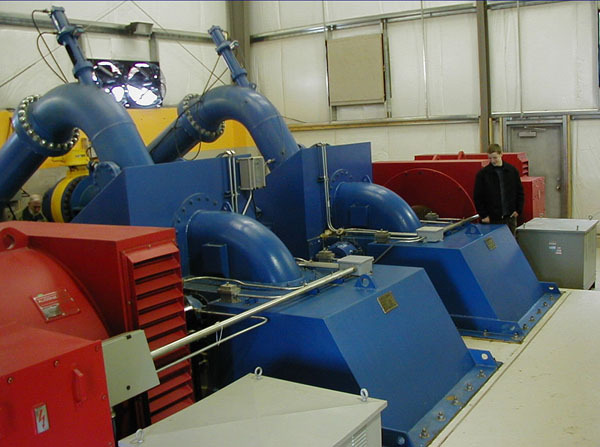 Turbine system during installation with Brett Bauer, Chief Engineer for Canyon Hydro. The completed powerhouse, with Canyon technician Spencer New. The Hystad project developers selected Canyon Hydro to design and manufacture the twin Pelton turbines. Canyon also provided Alconza generators as part of the water-to-wire system. The exterior of the Hystad powerhouse.